Tagab-e-Kishem district in Badakhshan, Northern Afghanistan was once barren. Most trees were cut down to provide wood for villagers. Medicinal plants and herbs on the mountains were collected with no thought of regrowth. There was hardly any rainfall, landslides were common and soil erosion was widespread. The habitats of various animals were destroyed. The visible impact of climate change on the landscape and communities was stark. The land appeared without hope. After three years of hard work with and by local villagers, that hopeless land is now unrecognizable. The barren hillsides are springing with life and color. The land is home to hundreds of trees, some loaded with fruit. Soil erosion is no longer an issue and animals, such as snow leopards, bears and deer, have returned to their homes and are now protected. After awareness campaigns, the villagers have become stewards of the land, caring and protecting it. Together with local communities, the Rural Green Environment Organization (RGEO) has brought revolutionary changes–working with Tagab-e-Kishem district and many others towards a second chance at growth and life. I work with RGEO, playing my part in creating a better world and fighting the effects of climate change. The organization recently won the Equator Initiative prize in Paris at the United Nations Conference on Climate Change. The prize enables us to implement more of our programmes in community adaptation to climate change, one in Kishem district, another in Baghlan province. Our projects are about reforestation and planting fruiting trees for communities to use, thus creating sustainable livelihoods. Others include assisting people to become more environmentally aware, empowering them to navigate the challenges of climate change. Afghan communities and their land have suffered greatly because of the ongoing war, which has lasted more than 35 years. Along with war, climate change greatly affects these communities. Afghanistan is a victim of climate change even though it contributes only 0.1 per cent to the total global greenhouse gas (GHG) emissions. Ten countries produce around 70 per cent of the world’s total GHG emissions and even though the greatest contributors are far away, the claws of climate change choke the world as a whole. Due to climate change, there is less rainfall in Afghanistan, more droughts and temperatures are rising. Environmental issues and disasters linked to climate change have destroyed crops and fruit trees. Last year, in March, an avalanche destroyed a village in Panjsher, killing more than 300 people. Our project in Kishem works with the community to improve the socio-economic and environmental deforestation in one of the remotest and poorest valleys in Badakhshan. Excessive and illegal logging of trees led to severe deforestation in this area. Communities struggling with poverty depended on the trees for fuel, because of the severe winters in this province. Awareness programs were launched in mosques. These involve local religious leaders, commanders and elders. We highlighted the environmental and long-term damage caused by excessive logging in a small area. People were encouraged to purchase wood from markets where it comes from various regions. We taught them to plant replacement trees and to be environmentally conscious. The program stresses that forests are vital for life and home to millions of species. They protect against soil erosion, produce oxygen, store carbon dioxide and help control climate. They also purify the air and water. The local communities we work with deeply appreciate the link between environmental protection and sustainable livelihoods. RGEO also provided training and environmental safeguarding to 90 villages, reaching over 40,000 people. Local communities helped plant more than 200,000 trees, and these implantations continue. 6,000 jobs were provided for communities and greenery returned to their hillsides. More than 8,000 wild vines have also been grafted with fruiting grapes, which only need a small amount of water to grow. Families are trained on how to graft these vines and will use the grapes to bring in a long-term income. Protecting the environment always has wide implications, impacting every part of a society. Through my work, I have seen that environmentalism also affects peace. Changes in the environment affect a community’s economics situation. When people are simply struggling to survive and their economic situation is in chaos, peaceful and harmonic solutions are not always seen as attainable. In these situations people seek the quickest way to ensure their own and their family’s survival. But healthy environments provide communities with controlled and sustainable resources and therefore, with options. Our work involves indigenous communities coming together to solve environmental problems as a means to improve their communities for future generations. One of RGEO’s proudest accomplishments is that people in our communities are very happy with our work. They are happy that greenery has returned to their hillsides and that they themselves are protectors of their environment. One elderly man in Tagab-e-Kishem district said that after a very long time, he was finally able to feel fresh air inside his lungs. He said that he felt deep joy in simply being able to do so once again. I believe that a breath of fresh air, in itself, is a step towards peace. 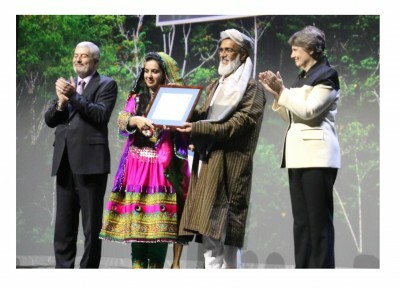 Photograph shows Farkhunda and her father Ahmad Seyer accepting RGEO's Equator Prize at the Paris award ceremony in December 2015. Click here for more information and a short film about RGEO's work.